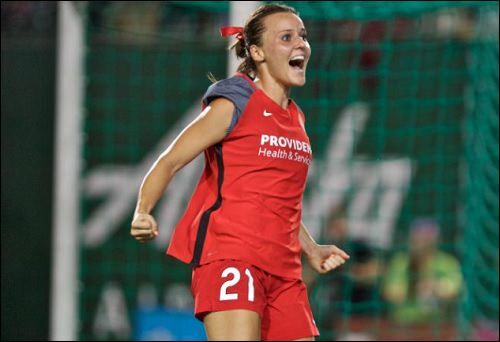 One of our favorite Thorns players is Hayley Raso, a native of Australia. She not only plays for the Thorns (#21), but also plays for the Matildas (#16), the national team of Australia. This is a piece posted on the Thorns website on August 2 with Richard Farley of Thorns.com. Here are the questions and answers between Farley and Raso. Richard Farley: Say ... you were away from the Thorns for, like, six months, and you were at a competition like the Asian Cup, and you had to come back and have one teammate meet you at the airport and have flowers waiting for you at home, who would you want that to be? Raso: (Confused by the specificity of the question.) What? Do you mean Celeste (Boureille)? Farley: Yes. We just want you to talk about Celeste. Raso: (Laughs.) Oh, Ok! She’s my roommate, one of my closest friends on my team, and she actually would have flowers for me if I was away for a while and came back. When I arrived here after Asian Cup, she had my bedroom ready – had put all my stuff in my room. She had flowers and a little sign that said “Home, Sweet Home,” but (the shape of) Oregon were the “o” (shapes) in “home.” It was pretty cute. She’s really sweet. She’s a great friend. Farley: So, tell us how us Americans keep mispronouncing Ellie Carpenter’s name? Raso: Well, you all think you don’t do it, but to me, it sounds like you’re saying “Allie,” like Allie Long. Like, maybe, A-l-l-y. You all say, “no, we’re saying Ellie,” and there are some people who do say Ellie, but we (Australians) hear it with an A. "Allie." So every time somebody like [Thorns assistant coach] Sophie [Clough] says, “Ellie, move here,” I think “Allie, Allie, Allie? Who's she mean by Allie? Farley: During your time playing with Caitlin Foord, what is the biggest change you think you’ve seen in her? Raso: I don’t know if people know this, but we actually played a different sport, touch football, together for our state when we were in grade six, when we were 12. There is this photo that I’ve posted on my Twitter from when we were 12, playing together, beside (a picture of) us in the national team, together. Obviously, she’s changed a lot since then. I think it’s just cool to see how far she’s come, getting into the national team at such a young age, and now she’s one of our main players and stars. She’s just so explosive. I feel like we play quite similarly, so I like to see how she’s attacking people and taking people on. I feel like I can try to do that, too. She used to play fullback, and now she’s playing wing with the national team. And I used to play wing, but now I’m playing more fullback. It’s funny. We’re pretty similar, I think. Raso: I don’t really think about it like that, but it is great to know that. I’ve worked really hard to be in the position I’m in, and I’ve been through a lot the past few years. It’s something I’ve always strived for: I want to be a regular, in the national team; I want to be a starter, in the national team. It’s the same here at Thorns. Seeing that I’ve grown so much and I’m able to be a regular in the national team, pushing for that starting position when I am with the national team, it’s exactly what I wanted. It’s been awesome. Farley: About the team in general, after Asian Cup, you hadn’t been together in forever, it seemed like, and now things are moving to where you’re consciously building toward France and the 2019 FIFA Women's World Cup. What are your expectations for the next year, going into that tournament? What do you want to accomplish, and where do you want to be by the time the next World Cup starts? Raso: I think the Australian national team has always been looked at as kind of an underdog. I think we kind of showed the world that we can really compete with big nations at the Tournament of Nations, last year. So, firstly, we’re looking to build, like you said, after a long time apart: in this tournament, getting everybody together and getting the core group there, training together, playing. Obviously, we’ve got a lot of games coming up, toward the end of the year and leading into France, but I think we do really well together when we’ve been apart for a while, and we can all kind of play in our respective teams. When we come back, we’re just so excited to be there and go. As the Thorns post more interviews with players, we will attempt to bring these interviews to our readers.